The German „Bundesarchiv“ has got some nice historical films on canoe slalom, starting in the 1950s. Credits to Armin Kießlich for the information. www.canoeslalom.net is an archive website for canoe slalom results from all over the world and I’d like to say „thank you“ to all the people, organizations and companies who are sending me result lists or who are publishing result lists on their websites. These websites are a major source for my archive. Armin Kießlich from Spremberg sent me some result lists of the World Championships from 1959 to 1975 – thanks! The World Championships which are still missing in my archive are 1949 to 1957, 1971 and 1977. Armin Kießlich (kieszlich@t-online.de) has got a lot more result lists, bulletins etc. from competitions in the 1960s and 1970s. Feel free to contact him when you are looking for something special. Vlady Danis did a great job: He created profiles for all world championships participants on the english Wikipedia. Of course, he found errors in my data, too – Thanks for all the corrections! 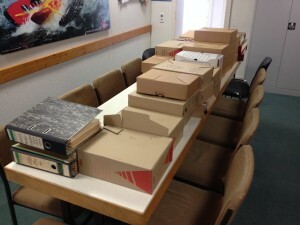 It took me less than 2 weeks to scan all the documents from the German Canoe Federation. Yeah! OK, there were duplicates in the boxes and folders and startlists and other stuff I don’t need for the website. And, of course, I’ve got a lot of the result lists, which they have, too. Overall, there are about 200 „new“ resultlists on the website. The oldest one is from the World Championships 1963 at Spittal/AUT. Beside scanning all the paper, I did some cleanup of my data. I took them all with me and will scan them all and publish them on my website in the (near?) future. At the moment I’m working on a google-based search function for the archive. So you can enter a name of an athlete and you will see all the results.